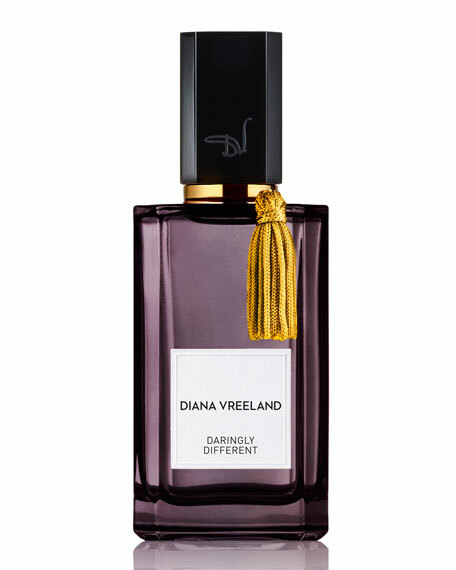 Daringly Different, created by Pascal Gaurin, is a tribute to Mrs. Vreeland's passion for the Middle East and its light, colors, and scents. Having vacationed frequently in Tunisia and Morocco, she brought the kaftan to the west and launched it to an international crowd through the pages of Vogue. This unique composition balances the luxurious floral elegance of iris with the magnetism of oud for a new take on a classic. The scent opens with crisp accents of violet before developing into a sophisticated heart of iris and lily. The deep smoky facets of the Oud accord are complemented with addictive nuances of Turkish rose, tonka and leathery notes to create a hypnotic fragrance experience.